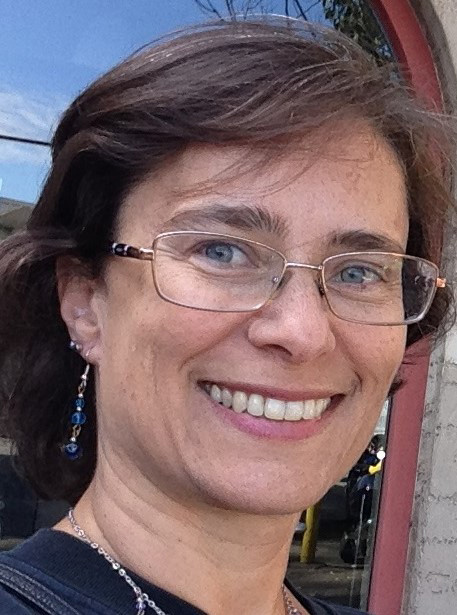 Rachel Freed grew up in the San Francisco Bay Area. She earned a B.S. in Biology from UC Davis and a M.S. in Neuroscience from Northwestern University where she studied neural transmission using confocal microscopy and electrophysiology. Rachel turned to teaching where she specialized for 10 years in high school chemistry and astronomy. She's now an educational consultant involved in, among many other things, curriculum design and implementation and training educators to use technology as a vehicle for change in education. She's also heavily involved in astronomy education and public outreach. 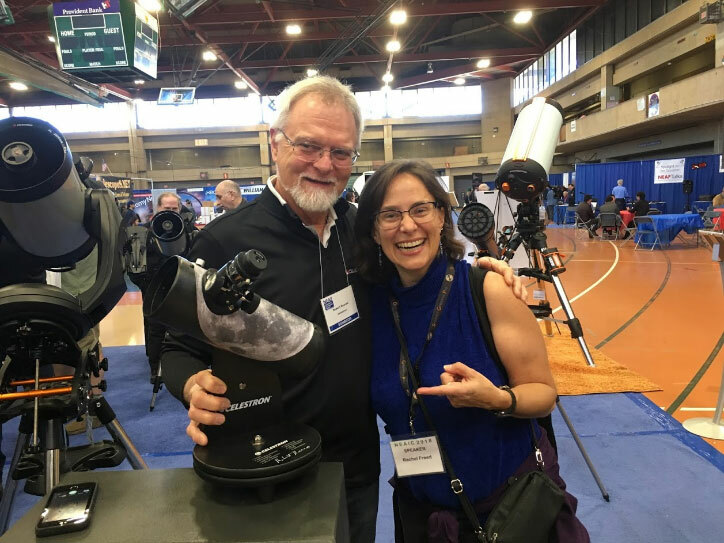 We first learned of Rachel's work from Robert Reeves at NEAF 2018, and we finally managed to connect to do a Q&A with this energetic and enthusiastic astronomer. Q: What course of events caused you to become an amateur astronomer? A: Nothing in particular; for some reason I have always been attracted to astronomy, starting with an interest in the constellations when I was about 9. Q: How is your current 'day job' related to astronomy? A: I am an independent consultant for education and as such I get to pick and choose amongst the opportunities that come my way or those that I create. I am currently the president of the Institute for Student Astronomical Research (InStAR) which I co-founded with Russ Genet and others, and, while I don't get paid for that position, I do teach Astronomy Research Seminars for undergraduates and high-school students and I do earn some money that way. We mostly do double star measurements of position angle and separation and then publish our findings in the Journal of Double Star Observations. I also give talks on astronomy and student research and occasionally get paid for that, and I organize and facilitate workshops to help promote student research in astronomy. Also, I am a Faculty Lecturer in the School of Education at Sonoma State University and I get to help design and run professional development programs for educators, and astronomy research sometimes falls under that umbrella as well. I'm currently designing a professional development workshop for teachers in which they will conduct double star research and write a paper for publication. Hopefully this will give them a better understanding of the actual process involved in scientific research and communication and be able to guide their students through the process as well. When you have time to get out with your telescope, are you primarily a visual observer or imager? A: I would prefer to be an imager but I don't generally have time for that, other than holding my iPhone up to the eyepiece of my 8” Meade LX90. However, I do have a ZWO camera that I sometimes use to do live video imaging but I haven't had the time to actually take images and process them. 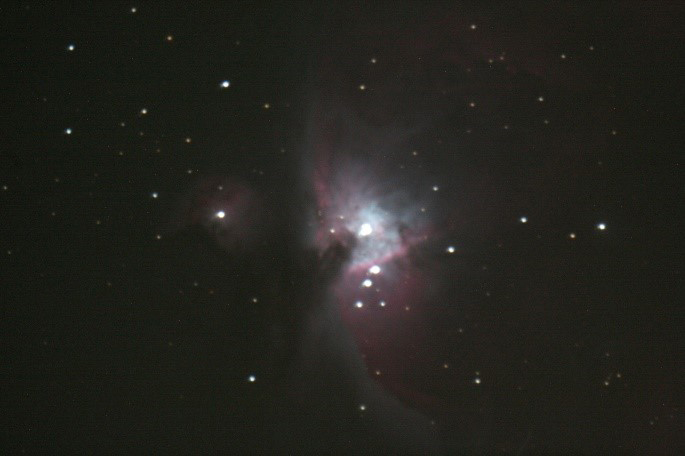 And as of November, 2018, I FINALLY got an older DSLR camera connected to my telescope and started taking images of the Orion Nebula and other amazing objects. I had been wanting to do DSLR astrophotography since 2000, and a friend lent me his old Canon EOS 20D about 3 years ago and I just now got around to setting it up. It's so much fun!! I also just shoot from the camera on my Star Adventurer tracking mount from Sky-Watcher USA. They have been a big supporter of my outreach. I was even able to capture some faint images of Comet Wirtanen! Q: What's your current favorite telescope set-up? Scope, eyepieces, accessories, camera, and so forth? A: I love the Meade LX90 that I've had for 7 or 8 years because it's pretty quick to set up. However,it's electronics are a little faulty at this point so I really can't use the GoTo function consistently which is very frustrating. It's more like having a Dobsonian right now. I'd love to get another telescope, really anything with good optics that's at least 9” in diameter. Of course, if money were no object, a PlaneWave CDK 700! And I am loving my DSLR on the Star Adventurer from SkyWatcher USA! Here's a link to my recent Orion Constellation image. The Orion Nebula image (below) was my first deep sky object observed from my telescope and camera in November 2018. I also really enjoy doing wide-field imaging and sharing that on Facebook and Instagram. 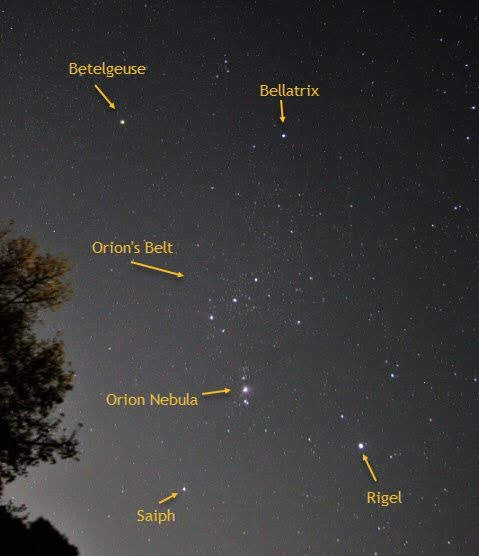 I try to add information so people can learn a little about the sky, even if it's just star names within constellations such as in the Orion image below. I can easily annotate images on my phone using the Skitch app or on the computer using Snagit. Q: What's your favorite celestial object (or type of celestial object) to observe with a telescope?? A: Spiral galaxies!!! I am a docent at the Robert Ferguson Observatory in Sonoma County, and I have used their C14 and Apogee U47 to do imaging and I think I could image M51 a hundred times and never get bored! Also catching supernovae is amazing! I have followed up on supernova alerts and then been able to compare images of the galaxy before and after the supernova was visible. That's pretty spectacular! Q: What celestial object do you yet hope to see through a telescope? A: I've seen many galaxies, supernova remnants, planetary nebulae, planets, and I've even done some exoplanet light curve work which was awesome! I've seen Saturn a hundred times and still love it, and I am always amazed to see Jupiter and its Galilean moons, always in different configurations. I take my telescope out almost weekly and just set in the sidewalk and look at Jupiter, Saturn and the Moon, and I show random folks walking past my house these objects. It's a lot of fun! Q: How is amateur astronomy different now than it was 20 years ago? What do you think amateur astronomy will be like in another 20 years? A: Amateur astronomy is so different now in that it's so much easier and more affordable to add imaging equipment to your setup, even at public star parties. When I first started doing astronomy outreach around 2000, very few people had imaging equipment in the astronomy clubs, and it was usually just a DSLR camera. Now there are affordable CCD cameras, and of course the telescopes and mounts have gotten so much better! I'm thinking of the PlaneWave Instruments direct drive systems. Also, collaborations between manufacturers and software developers are pretty great at times. I saw that SkyX(from Software Bisque) connects with ACP (observatory control software) for scheduling observing runs, which is pretty awesome. Of course, this is all hardware and software that I hope to be able to afford myself some day. In another 20 years, well, it's hard to imagine, but also pretty exciting to imagine. Of course, the technology and affordability will continue to improve, and also connections with the next generation of professional programs I think will continue to become more important. I can imagine in 20 years a system where I have a personal 1-meter telescope that receives alerts from the likes of the James Webb Space Telescope, TESS, LIGO-VIRGO and others, and automatically does follow-up observations. I realize this can be done now, but it's not affordable for most of us just yet! Q: Is there anyone (alive or otherwise) who particularly inspires you to continue your astronomical activities and outreach? A: Several people! Russ Genet, my original mentor, and Michael Fitzgerald, my second mentor and Ph.D. advisor, inspire me regularly! They have both done amazing things for telescopes and education and student research, and both continue to do pioneering work in these domains. They are my biggest champions and supporters and it's because of them that I can do all the things I'm doing now, which basically constitutes a decades-long dream-come-true.. 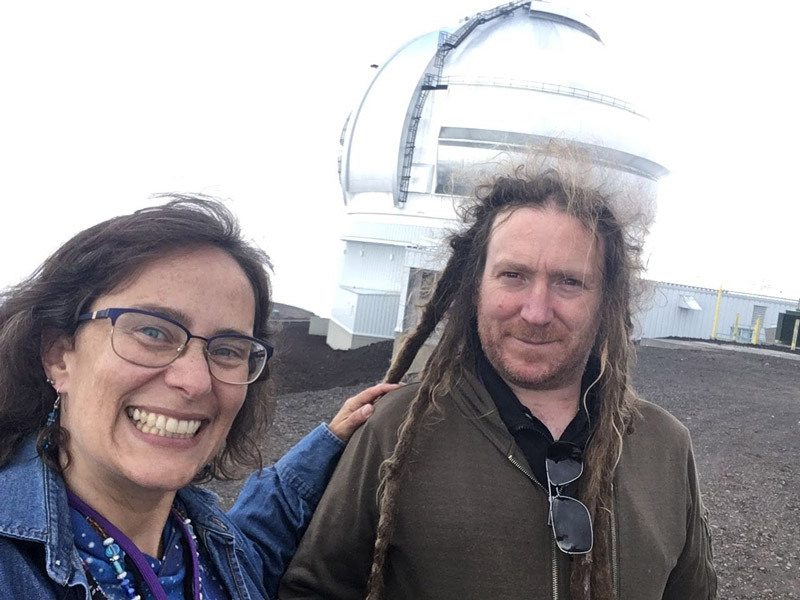 Figure 4 - Rachel Freed and astronomer Michael Fitzgerald atop Mauna Kea in Hawaii. Michael and I and others organized and ran the 2nd annual Robotic Telescope, Student Research, and Education (RTSRE) conference in July 2018. He is also my Ph.D. advisor. Additionally, Robert Reeves has been an amazing supporter and friend. He has given me some of the imaging equipment I use, and invited me to speak at the 2019 Texas Star Party which I am so incredibly excited about! And his Moon astrophotography and knowledge are amazing! Figure 5 - Robert Reeves and Rachel Freed at NEAF 2018. Q: Other than clever videos and science sound bites, how can technology enhance the teaching of astronomy for the interested public, young and old? A: I teach research seminars through the Zoom online video meeting platform, so that's cool. And using iPads and iPhones to control telescopes or do simple astrophotography are great tools to engage and teach the public. Also, the Institute for Student Astronomical Research is one of the 22 or so Education Partners with Las Cumbres Observatory, meaning that I can have my students use the network of ten 0.4-meter LCO scopes around the globe to get images through a web-based portal. Then we use free software to do astrometry, measuring position angles and separations of double stars. This is technology used for learning and research! In addition, I have done live video spectroscopy using R-Spec software and a diffraction grating at public star parties and THAT is a great way to engage the public and teach them pretty detailed scientific concepts around the electromagnetic spectrum and stellar classification! Q: Can you share one of your best outreach experiences? A: I have so many stories and there have been a thousand times where someone looked through my telescope and I waited that split-second before I heard them exclaim “oh my gosh!” or something to that effect. I love it every time. But a fun story I will always remember was when I was driving in a dark skies area in Sedona, Arizona. It happened to be in a residential area, but it was really dark. So I pulled over in a clear area, unloaded all my telescope equipment and started observing. Within a few minutes, my night vision was completely destroyed as a police car pulled up, with all their bright lights shining on us! Apparently, someone had called us in and reported our suspicious activities. The cops were really nice and I showed them Saturn through my 10” Meade. They had never seen it before and were, of course, blown away. Nonetheless, they apologetically told me I would have to pack up and leave because it was a residential area. Figure 6 - Curious observers at astronomy outreach events. Really my favorite moments are when these really young girls, about 5 or 6 or 7, become fascinated with looking through the telescope. I had one girl spend about 30 minutes with the telescope, which I had set on the ground, rather than a tripod, so kids could easily observe. I taught her how to manually move the telescope around and she just loved it! Another great time was at Yosemite this summer, we were doing a star party at Glacier Point and we started setting up just as a wedding reception was happening. I ended up having all these bridesmaids and people in suits and ties, having had a few glasses of champagne already, looking through the telescope and it was just a really fun social event in an amazing setting. Figure 7 – Rachel Freed in action at an astronomy outreach event. I also love that my daughter, who is 11, enjoys teaching people about the telescope and what we are observing. She's learning from me and loves to show what she knows. Recently I've started setting my telescope and camera up along the local bike path and dozens of people will stop by and look at the moon or whatever I'm observing. It's a lot of fun and it builds a wonderful sense of community. I love being part of the larger community and helping others join that community. I was pretty excited when Meade Instruments asked if they could share one of my Instagram posts of my son using the Coronado PST to observe the sun. Q: Why is it important to teach astronomy to children? Shouldn't they be learning a more practical field like electronics, biochemistry, or coding? A: Astronomy captures the imagination as few other disciplines and has done so for all of human history. It's important because it's the study of the universe in which we exist and an attempt to understand our place within it. Also, if students can learn to do research in astronomy, including learning how to critically analyze data, as well as how to communicate science, they will be better able to apply these skills in general, and that's critical for an educated society. We can leverage the general fascination and interest in astronomy to help teach science and scientific communication, and that's important. Q: You also do astronomical research on double stars. How did you come to do this work, and why is it important? A: Well, it's a great story. I was at the 2014 SAS (Society for Astronomical Sciences) annual symposium, and I heard someone mention Russ Genet and say that he was “a force of nature”. I thought to myself, “I want to meet this force of nature”, so when I later heard someone say “Oh, there's Russ Genet”, I went up and introduced myself. We started talking and I was interested in the Astronomy Research Seminar he had been teaching at Cuesta Community College, and he was interested in the online teaching I had done, and we decided to collaborate. He had been having students do double star research projects because it's a topic that can be researched reasonably within a semester and the data is valuable, publishable and contributes to our understanding of stellar evolution. As our techniques improve, we can measure position angles and separations of closer and closer pairs, with larger differential magnitudes.This helps us refine orbits and better understand the low-mass dim stars, those in the lower right of the Hertzsprung-Russell diagram, the dim K, L, M and T stars. We are moving into more speckle interferometry which allows to push the limits on separations we can resolve. We are also working to branch out into studying exoplanet transits, eclipsing binaries and asteroid light curves, however these are more time-intensive and require significantly more facility with data collection and software. Double stars are really straight forward and an excellent starting point for a novice. Here's a link to my CV in which you can see all the research I've participated in with students. All the JDSO publications are research projects led by students, with help from me, Russ Genet, and others. Q: What other research opportunities are available for amateur astronomers right now? A: There are many pro-am collaboration opportunities such as through the AAVSO (https://www.aavso.org/), and now TESS follow-up programs. With the growth of Citizen Science, such as Zooniverse (https://www.zooniverse.org/), pretty much anyone with any level of experience or equipment can participate in astronomical research. Also, getting involved with organizations such as the Society for Astronomical Sciences (http://www.socastrosci.org) or the Center Backyard Astrophysics (CBA; https://cbastro.org) can jumpstart one's participation and learning within the amateur astronomical community. Q: For those interested in astronomy but do not have a telescope (or for those with a telescope but without clear skies), what are some other ways to engage with their passion for astronomy, other than watching documentaries and looking at pictures? A: For those without telescopes, many of the Citizen Science programs listed above are good entry points. There are also many remote telescopes that one can purchase time on such as Slooh and iTelescope, for example, or use for free such as MicroObservatory or Skynet. Skynet requires going through their free online courses, and is an amazing way to learn about astronomy and telescopes! If you have a telescope but no clear skies, that's trickier. Traveling to the many different star parties around the country is one option, but that requires significant time and money. I will say, I've recently started turning my telescope to raptors here on planet earth and I LOVE imaging them. With a modest telescope and a cell phone you can get some amazing images and videos! Q: You have made many contributions in education, outreach, and research. What contributions do you still hope to make? A: I am still dreaming of contributing to ongoing, dynamic conversations and actions within a global context around astronomy and astronomy education. With much help I have put together the beginnings of “Astrocom” or an Astronomy Community, where we have regular global online meetings through Zoom, inviting all past participants of the Robotic Telescopes, Student Research and Education (RTSRE) conferences to join in and invite their friends and colleagues. The idea is to keep up the momentum from discussions and collaborations that occur at the meetings. It's often difficult to maintain momentum when everyone goes back to their daily routines in their corner of the globe, and I want to facilitate this and provide a forum for supporting each other all year long. Also, I love connecting people, for example, those who have telescopes or telescope networks with those who would like to use a telescope, or those who teach astronomy with those who can help students do astronomical research, or those who are looking for mentors with those looking for mentees. So much of what's important in life is the connections we have with people and this is such an exciting field with so many people around the globe being passionate about it. At NEAF 2018 I was able to introduce a student who had participated in the Astronomy Research Seminar at Stanford Online High School in California with Don Bruns who had just replicated the Eddington experiment during the August 2017 Solar Eclipse and is always looking for bright students to work with. Q: Amazingly, you have found time to start a Ph.D. program in astronomy. How is that going, and what research do you plan to do as part of your studies? A: The Ph.D. program is really exciting and also intimidating. It's amazing that I get to study questions about the impacts of astronomy research programs that I've been pondering about for years. I get nervous, though, because I feel like I need to become an expert in so many things to really do a high-quality job in asking and answering the questions. But it's fun and the people I work with are AMAZING! I'm interested in how astronomical research programs for teachers and students impact their self-efficacy, or the sense that they can do astronomy research, and how it changes teachers' pedagogical approaches in the classroom and student educational and career choices. In other words, does what we do in providing research experiences have any real impact?! A: For aspiring amateur astronomers, join the local astronomy clubs, attend star parties, follow your passion and don't ever give up. Jump in with both feet. If you been looking at the stars for a long time and losing interest, consider participating in astronomical research! Or mentoring! There are so many students from middle school up through community college who desperately wanting help getting into observing, imaging, and research. Often all it takes to make someone's dreams come to life is guidance from an expert! It's only through the help and encouragement of amazing mentors that I've gotten to where I am today, leaving out dreams I couldn't have dreamt of 20 years ago! This article is © AstronomyConnect 2019. All rights reserved.